SLAM style composition competition for cash prize! Registration for songSLAM 2018 opens on September 10, 2018. 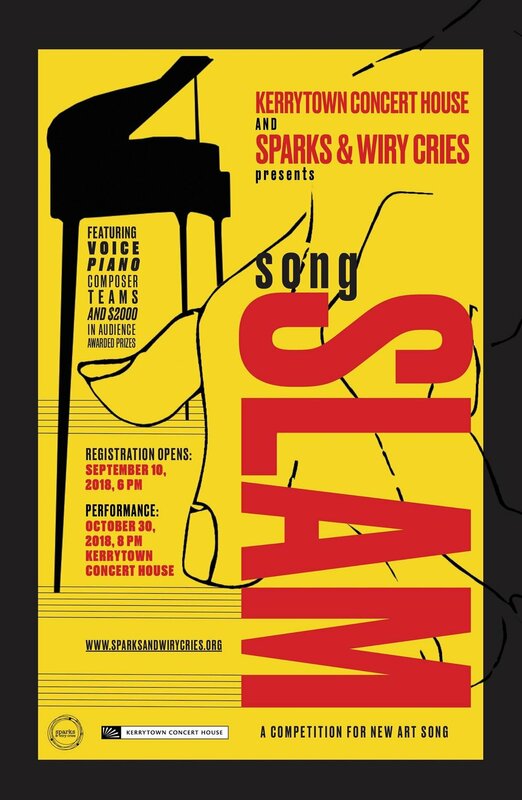 The Sparks & Wiry Cries songSLAM is a unique opportunity for composer/performer teams to premiere new art songs and compete for cash prizes. - Tuesday, October 30 at 8:00 pm at the Kerrytown Concert House, Ann Arbor, MI. - Tickets: $10 for students with ID, $15 general admission. 1) Registration is $15 and opens on September 10, 2018 at 6pm on a first-come, first-served basis. 2) Performance slots will be given to the first 10 applicants to apply; there will also be 5 alternate slots in the event of cancellations. 6) Texts may be in any language. 9) Scores for songSLAM must be completed and submitted by no later than October 1, 2018.